What to do when you're out and and about the need to eat arises? A group of us had met up and gone to La Suite West for afternoon tea. It lasted a while because we used it as an opportunity to eat and drink slowly, whilst having a catch up. After that, a few of us went for a walk and we realised that if we went home, it would be too late to cook and eat, but it was a little to soon to eat. So we decided to go for a coffee and then find somewhere to eat after that. What do you do when the restaurants around you aren't familiar? All the places we passed were either cafés or they restaurants were but they were super packed! Also, lots of them were unfamiliar, so we weren't sure if they would able to cater for us or not. We came across a place called Franco Manca, which was busy, but it looked like a few of the tables may be empty soon. We decided to ask if they had any vegan options. What have we got to lose right? At best, they'll say 'yes, come on in' and at worst, they won't have anything, but they'll realise that there is a need for vegan options and they may consider changing their menu. Not a bad worst case scenario in my books! How did Franco Manca do in terms of catering for vegans? 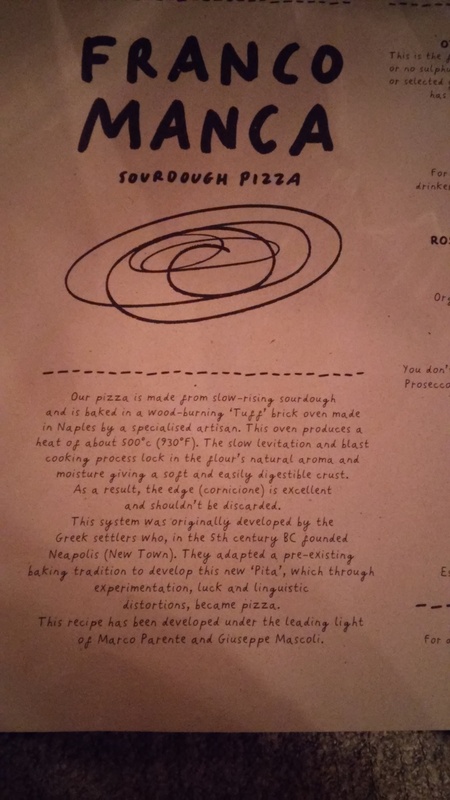 I was delighted that we went in and asked because their pizza was delicious! The staff were attentive even though, after we were seated, they were turning customers away, because they were so busy! Suraj and I shared a delicious pizza with extra toppings. I left feeling content, nourished and chuffed to have had the opportunity to eat there. So is it difficult for vegans to eat out? If this article isn't enough to show you how easy it can be, check out some of the reviews below.